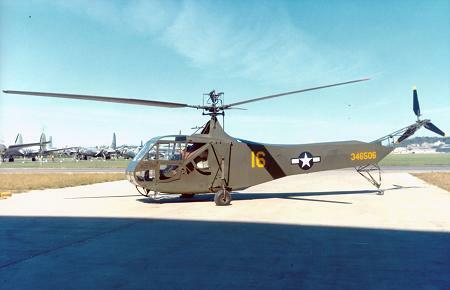 33'8" by 38' (rotor) by 12'5"
The R-4 Hoverfly or "Eggbeater" was the first mass-produced helicopter and the first Allied helicopter to see operational use. Two prototypes were sent to Alaska and Burma, and showed enough promise that the Army Air Forces ordered 100 production aircraft. Four of these saw operational use with 1 Air Commando Group in Burma, where they were used as observation aircraft and to evacuate the wounded from otherwise inaccessible locations. A small number were also used for air evacuation in the second Philippines campaign.